Nucleosomes help to supercoil the DNA. DNA structure suggested a mechanism for DNA replication. DNA polymerases can only add nucleotides to the 3’ end of a primer. DNA replication is continuous on the leading strand and discontinuous on the lagging strand. DNA replication is carried out by a complex system of enzymes. Some regions of DNA do not code for proteins but have other important functions. Application: Rosalind Franklin’s and Maurice Wilkins’ investigation of DNA structure by X-ray diffraction. Application: Use of nucleotides containing dideoxyribonucleic acid to stop DNA replication in preparation of samples for base sequencing. Application: Tandem repeats are used in DNA profiling. Skill: Analysis of results of the Hershey and Chase experiment providing evidence that DNA is the genetic material. Skill: Utilization of molecular visualization software to analyse the association between protein and DNA within a nucleosome. 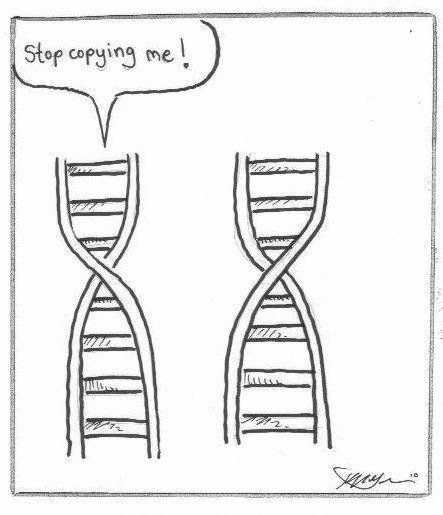 Aim 6: Students could design models to illustrate the stages of DNA replication. Details of DNA replication differ between prokaryotes and eukaryotes. Only the prokaryotic system is expected. The proteins and enzymes involved in DNA replication should include helicase, DNA gyrase, single strand binding proteins, DNA primase and DNA polymerases I and III. Essential idea: Information stored as a code in DNA is copied onto mRNA.